Ryan brings over a decade of luxury sales and service to the real estate industry. With a commitment to delivering the ultimate customer experience, Ryan recognizes that his job is not done until a client experiences that magical moment finding their dream apartment. Ryan's knowledge of neighborhoods, condo's, and the nuances of co-ops make for a seamless transaction. He believes that his role as your real estate agent reaches far beyond the deal. His consultative approach, passion for exceptional service and loyalty to his clients are the foundation of his success. 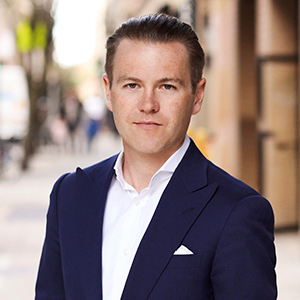 Ryan spent a decade at Ralph Lauren; first in luxury sales, then in training and development. It was at Ralph Lauren that Ryan developed a true understanding of how to deliver a world-class luxury experience. Ryan's last year with the brand was spent opening The Polo Bar, where he was responsible for recruiting and training. Originally from Denver, Colorado, Ryan, and his wife currently reside in downtown Manhattan. Ryan supports and volunteers with City Harvest, AIDs Walk New York, Citymeals-on-Wheels, and God's Love We Deliver.